Background: Recent findings at Jamaica Bay documented a loss of over 300 hectares of wetlands of Spartina alterniflora island marshes (Hartig et al. 2001, 2002). 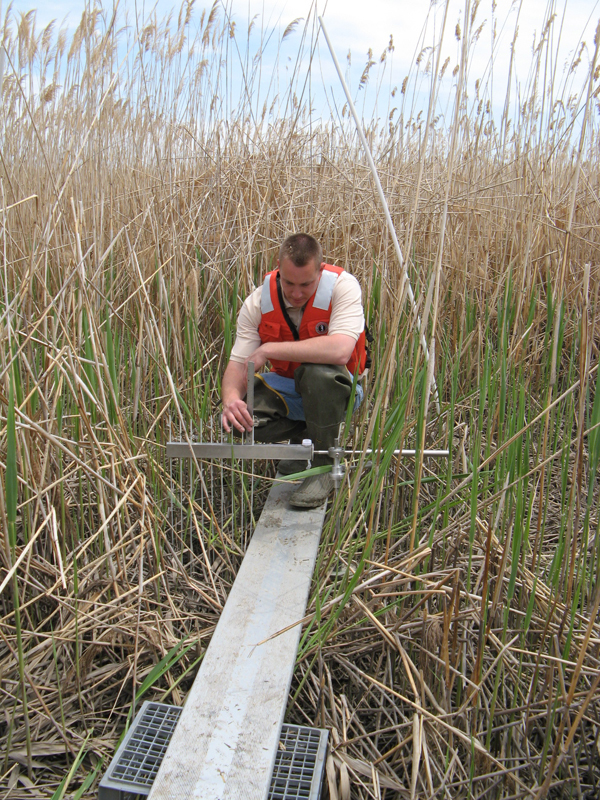 In addition many marshes along the north and south shore of Long Island have experienced significant marsh loss (NYSDEC 2006). 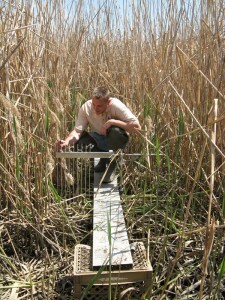 James Titus has illustrated that marsh loss is also occurring in more southern parts of New Jersey (1988). Many of these marshes have now become coastal shoals and mudflats. 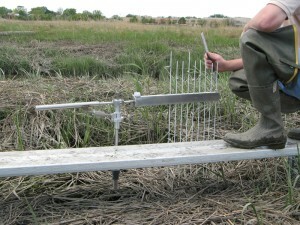 The New York Times printed an article (August 2, 2007) announcing that “Jamaica Bay Loses Marshes at Faster Rate, Report Says; Disappearance in Five Years is Feared.” In light of these discoveries, investigators in cooperation with USGS will conduct monitoring of marsh elevations at the New Jersey Meadowlands using Surface Elevation Tables (SETs) and feldspar markers (Cahoon & Lynch 2005). 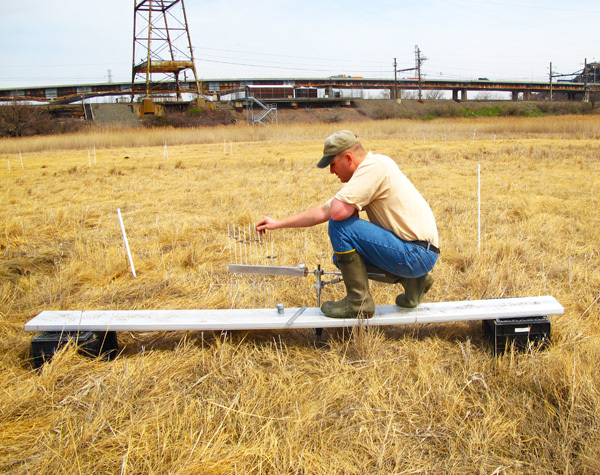 The monitoring will allow the team to determine rates of accretion in marsh areas, and to track and compare both shallow and deep subsidence. Comparisons will also be made with subsidence rates in the region. On invitation from MERI and FDU, Don Cahoon and Jim Lynch of USGS toured the Hackensack Meadowlands on July 5, 2007 visiting potential monitoring sites by boat. Also in attendance were: Francisco Artigas, Brett Bragin, Ed Konsevick, MERI; Alice Benzecry, FDU; Ellen K. Hartig, NYC Department of Parks and Recreation, Natural Resources Group (DPR/NRG). A discussion at the MERI offices followed, and Dr. Cahoon and Dr. Lynch gave their recommendations for SET installation and monitoring. Equipment needs, site selection, timing, training, monitoring, and costs were discussed. Site selection: The following sites were selected to represent Hackensack Meadowlands natural and restored sites tidal marsh vegetation. 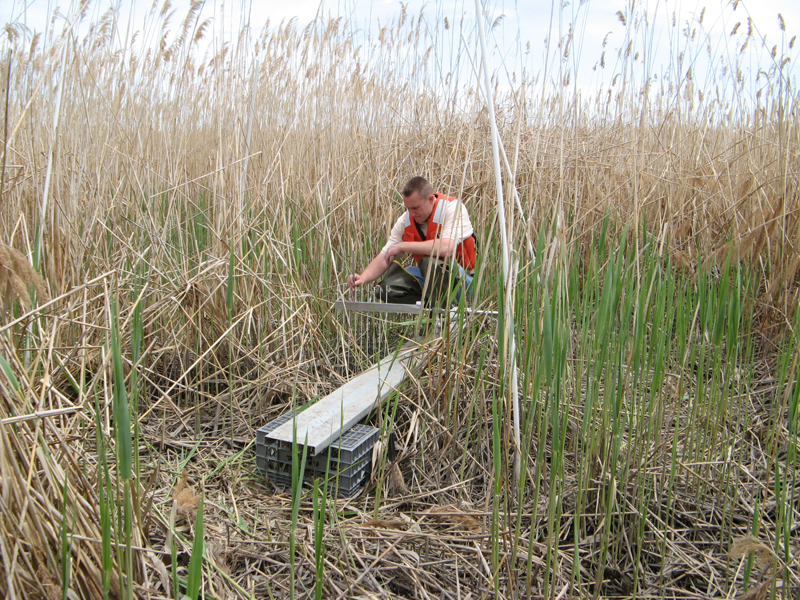 The five sites selected include a restored Spartina alterniflora low marsh, a Spartina patens dominated high marsh, a mixed Spartina patens and Phragmites australis high marsh and one Phragmites australis dominated high marsh. Included is a site where feldspar markers were placed approximately four years ago and measurements were obtained during the July 5, 2007 field reconnaissance. Marker horizons are commonly used in conjunction with the SET. Marker horizons measure vertical accretion which predominantly incorporates Surface Processes. SET benchmark rods installation: SET benchmark rods were installed in Spring 2008 under the guidance and supervision of USGS team member Jim Lynch. Installation took place over two days. MERI personnel supported the field work. Three benchmarks were installed at each site for a total of fifteen benchmarks. As part of the installation phase, each benchmark location will be surveyed and mapped by MERI using GPS. Marker Horizons placement: Feldspar and/or sand will be used as markers and it will be placed near each benchmark. At each benchmark, Surface Elevation Table (SET) will be read at eight different positions (one statistical unit) three times per year. The fifteen units will be read at three month intervals during Spring, Summer and Fall (no winter readings). Special care must be taken to ensure that readings are obtained in a consistent manner. Data analysis and report preparation will be conducted by Joe Grzyb of MERI. Initial monitoring results will be analyzed and a report will be prepared within 18 months after installation is completed. Cahoon, Donald R. and J. Lynch. 2005. Surface Elevation Table (SET). Retrieved 9 January 2007 from: http://www.pwrc.usgs.gov/set/ Gornitz, V., S. Couch, and E.K. Hartig. 2002. Impacts of sea level rise in the New York City Metropolitan Area. Global and Planetary Change 32:61-88. Gornitz, V. Sea Level Rise and Coasts. Chapter 3. In Rosenzweig, C. and W.D. Solecki (Eds.). 2001. Climate Change and a Global City: The Potential Consequences of Climate Variability and Change – Metro East Coast. Report for the U.S. Global Change Research Program, National Assessment of the Potential Consequences of Climate Variability and Change for the United States, Columbia Earth Institute, New York. 224p. Accessed 2 August 2006 from http://ccsr.columbia.edu/cig/mec/05_Wetlands.pdf. Hartig, E.K. Wetlands. Chapter 5. In Rosenzweig, C. and W.D. Solecki (Eds.). 2001. Climate Change and a Global City: The Potential Consequences of Climate Variability and Change – Metro East Coast. Report for the U.S. Global Change Research Program, National Assessment of the Potential Consequences of Climate Variability and Change for the United States, Columbia Earth Institute, New York.224p. 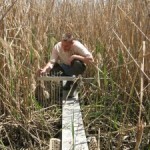 Accessed 2 August 2006 from http://ccsr.columbia.edu/cig/mec/05_Wetlands.pdf. Hartig, E.K., Gornitz, V., A. Kolker, F. Mushacke, and D. Fallon. 2002. 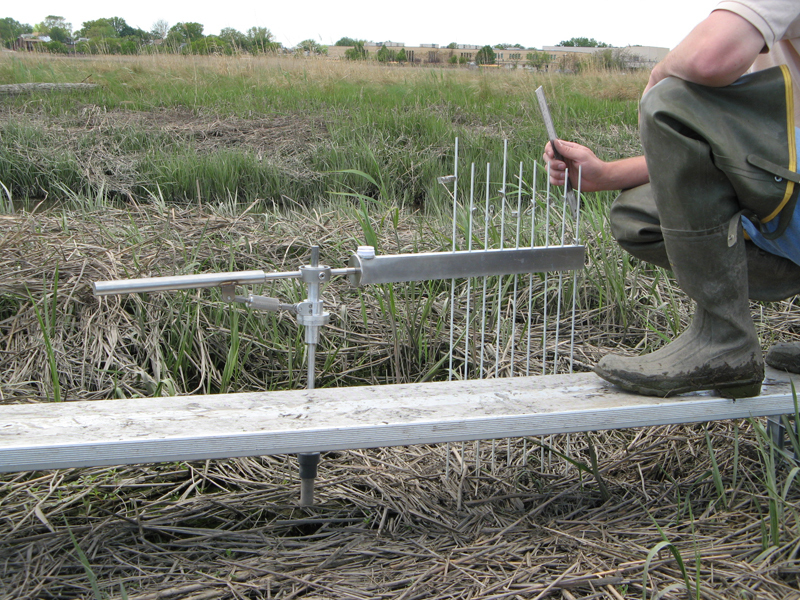 Anthropogenic and climate-change impacts on salt marshes of Jamaica Bay, New York City. Wetlands 22(1):71-89. Intergovernmental Panel on Climate Change(IPCC). 1998. The regional impacts of climate change: An assessment of vulnerability. Cambridge University Press, United Kingdom. 514 pp. New York State Department of Environmental Conservation (NYSDEC). 2006. Welcome to Marine Habitat Protection. Retrieved 22 November 2006 from: http://www.dec.state.ny.us/website/dfwmr/marine/twlossstrat.html NOAA, 2003. Historic Sea Level Trends. Center for Operational Oceanographic Products and Services (CO-OPS): http://coops.nos.noaa.gov/sltrends/sltrends.shtml Titus, J. G. 1988. Greenhouse Effect, Sea Level Rise and Coastal Wetlands. U.S. EPA Office of Policy, Planning, and Evaluation, Washington, DC, USA. EPA-230-05-86-013.